Dato che siamo studenti fuori sede, è tutto ovviamente under 20€! Like we said in the previous post, we will move soon in a new house and we will live in a small apartment in the center of Milan (the city where we live and study). There isn't a better occasion for diving into a lot of home-decor websites, dreaming and taking note of neverending cute objects to personalize and furnish our new corner of the world! For the moment we focused on the bedroom. Since we are students out of our "family home", it's all under 20€, of course. 1. Portafoto ad albero, 19.90€ (Maisons Du Monde). 2. Appendiabiti Juancho, 11.99€ (Zara Home). 3. Specchio Ekne, 10.07€ (Ikea). 4. Candele cactus, 14.90€ (Maisons Du Monde). 5. Lampada Knubbing, 9.99€ (Ikea). 6. Cornice Christine, 17.99€ (Zara Home). 7. Cuscino Lace, 19.99€ (Zara Home). 8. Contenitori Columbus, 11.99€ e 17.99€ (Zara Home). This is a lovely moodboard, white is just so elegant! 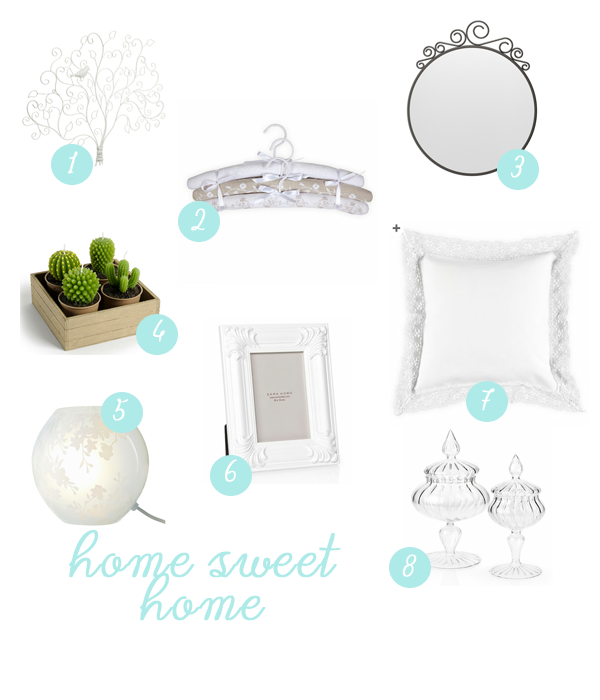 I dream of one day having a home that is decorated in all white! All of these things would fit perfectly in my dream home :) Good luck with your move! Ci vediamo e grazie per le tue parole!! Bacci rossi y buona settimana! Grazie mille :D sono felicissima che ti piaccia! Anche io sto cambiando casa... ottime idee! Love the first one the most! Thank u <3 The one is also my favourite! ah se sapessi come adoro questo genere di oggetti!!! love all the light colors!!! These are all great picks. Makes me want to redecorate!